Florida Data Cabling provides the best quality Data and Communications Installation services. We are committed in giving our clients professional and reliable network cabling services across South Florida. 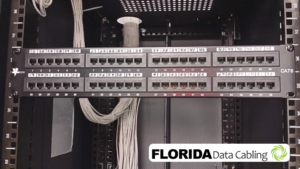 We understand how important network reliability, security, and functionality are to your business and here at Florida Data Cabling, our dedication goes with your business success. Our data cabling installers have designed and installed numerous office data cabling projects, for companies of all types and sizes in South Florida and surrounding areas including Miami, Fort Lauderdale, and West Palm Beach area. We are your partner, your network cabling provider. We will work with you every step of the way from site surveys to design to implementation to support, we are dedicated to help pave the way to success and growth of your business. Our years of servicing in Data Cabling Hollywood have given us the experience and expertise in this field. We have built an impressive track record of designing and installing scalable structured cabling solutions across numerous locations in South Florida. Our services include data cabling, data wiring, phone cabling, phone wiring, cat5 cabling, cat6 wiring. Whether you need few to several or thousand nodes, we at Florida Data Cabling is at your service. For Florida Data Cabling, no job is too big or small. We have the experience and resources to complete installations of 1 or 1000s Cables. Structured cabling for Office buildings (small, medium and enterprise sized business), Data centers, call centers, small offices and warehouses. And if you happen to have repair and troubleshooting needs, we are your network cabling emergency buddy! We understand the complexity and frustrations you might be dealing now might it be in data cabling, data wiring, phone cabling, phone wiring, cat5 cabling, cat6 wiring, Florida Data Cabling is your solution. Let experts in Data Cabling Hollywood take care of the job, so all you need to worry about is what really matters your business. Trust your voice and data cabling needs to us. We look forward in connecting you to your business goals. Call us today for a free onsite estimate.